NEW YORK– October 13, 2012 – The creator and cast of "Da Vinci's Demons," the highly-anticipated STARZ Original series premiering Spring 2013, came together for the first time today at New York Comic Con. 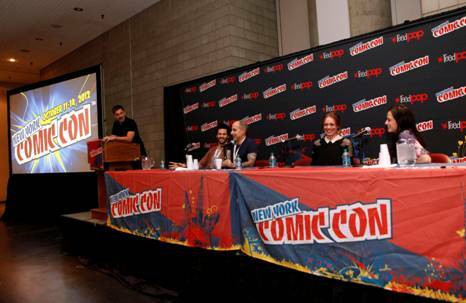 Creator David S. Goyer and cast members Tom Riley, Laura Haddock and Lara Pulver took the stage in front of a packed house at the Javits Center to take part in a panel discussion moderated by Entertainment Weekly's Geoff Boucher. Attendees were treated to a sneak peek of the drama series, as well as a glimpse behind the scenes courtesy of the cast and creator. During the panel, creator David S. Goyer introduced the series to a roaring crowd calling his Da Vinci a "Tony Stark prototype," to which Tom Riley-- who portrays the titular character-- agreed, "Mixed with a bit of Sherlock Holmes and Indiana Jones." They spoke about the research into the life of Da Vinci, the gaps and the creative ways the series imagines them filled, and the ladies detailed their love of the costumes, with Laura declaring that Emmy® Award winning costume designer Annie Symons "takes a box, jumps out of it, then runs a mile." The panel ended with a second viewing of the trailer, which only contributed to the fans growing intrigue. "Da Vinci's Demons," written by David S. Goyer (co-writer of blockbuster and critically-acclaimed films Batman Begins and The Dark Knight, and writer of the upcoming Man of Steel), is a historical fantasy, following the 'untold' story of the world's greatest genius during his turbulent youth in Renaissance Florence. Brilliant and passionate, the 25-year-old da Vinci is an artist, inventor, swordsman, lover, dreamer and idealist. As a free thinker, with intellect and talents that are almost superhuman, he struggles to live within the confines of his own reality and time. He begins to not only see the future, but invent it. "Da Vinci's Demons" stars Tom Riley ("Monroe," I Want Candy) as a young Leonardo da Vinci, Laura Haddock (The Inbetweeners Movie, "Honest," Captain America: The First Avenger) as Lucrezia Donati, the mistress of Lorenzo Medici and lover of Leonardo da Vinci and Lara Pulver ("True Blood," "Sherlock," "Robin Hood") as Clarice Orsini, head of the Medici Bank and de facto ruler of Florence. "Da Vinci's Demons" is the first project to enter production under the multi-year agreement between Starz and BBC Worldwide Productions. Goyer is showrunner. Julie Gardner is Executive Producer, along with BBC Worldwide Productions' Head Jane Tranter. Production began in Wales in summer 2012 and wraps in the fall. STARZ will premiere the eight-episode series in the U.S. in 2013. BBC Worldwide will distribute the series in international territories. Starz Entertainment, LLC, is a premium movie and original programming entertainment service provider operating in the United States. The company offers 17 premium channels including the flagship STARZ® and ENCORE® brands with approximately 19 million and 32.8 million subscribers respectively. Starz Entertainment airs in total more than 1,000 movies and original series every month across its pay TV channels. Starz Entertainment is recognized as a pay TV leader in providing HD, On Demand, HD On Demand and online advanced services for its STARZ, ENCORE and MOVIEPLEX brands. Starz Entertainment (www.starz.com) is an operating unit of Starz, LLC, a wholly-owned subsidiary of Liberty Media Corporation (NASDAQ: LMCA). BBC Worldwide Productions, led by Jane Tranter, is based in Los Angeles and develops and produces scripted and non-scripted projects for U.S. cable and broadcast networks, as well as digital platforms. The production company is responsible for the smash hit "Dancing with the Stars" (ABC), "Top Gear" (HISTORY), "What Not to Wear" (TLC), "Torchwood: Miracle Day" (Starz), "Hairy Bikers" (HISTORY) and the upcoming titles "The Week the Women Went" (Lifetime), "The Next Big Thing" (Oxygen) and "Da Vinci's Demons" (Starz). BBC Worldwide Productions sits within one of six core businesses that form BBC Worldwide, the main commercial arm and wholly-owned subsidiary of British Broadcasting Corporation (BBC).